Having smart devices in you home can make life much easier. If you have Amazon’s Alexa in your home, you may be searching for compatible devices that work with that system. There are many different options available that will enhance your enjoyment of your home through making your life easier. An Alexa-compatible light switch can make turning your lights on and off easy from anywhere in the room. 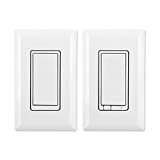 These types of light switches are relatively easy to install and most installations can be done by those who have no prior electrical experience. 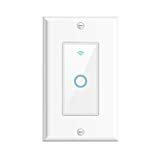 When choosing an Alexa light switch for your home, it can be helpful to do some research to be sure it will fit into the space you have in your home. You should also read up on the installation process of the light switches you’re considering to be sure you can install the switch easily. Most Alexa light switches will sync up to your device immediately so you can begin using voice commands to control your lights from anywhere. 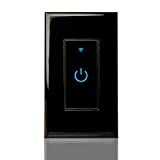 The following is a list of the top 10 best Alexa light switches. 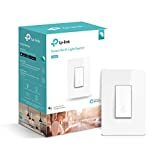 The TP-Link Smart light switch set is compatible with your Alexa and doesn’t require a hub for usage. This light switch allows you to turn your lights on and off from anywhere with your mobile device. You can use the away-mode to turn devices on and off when you’re not home as a safety precaution or to conserve power when you don’t need lights. 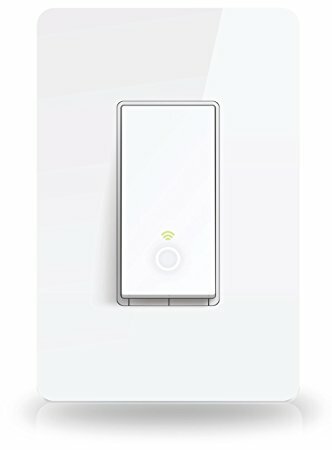 This light switch from TP-Link allow you to check on your devices remotely and create schedules and timers for your lights. The installation of this switch requires a neutral wire and they should be installed with a plastic face plate for the best signal. 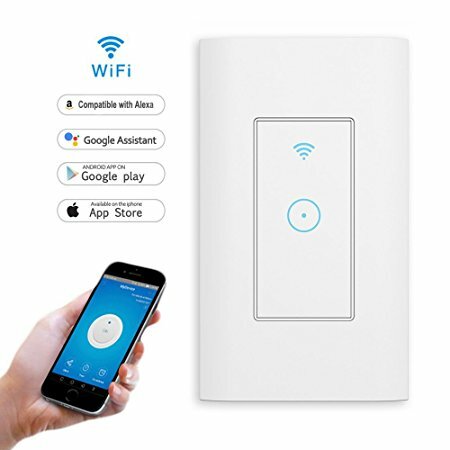 The Smart Wi-Fi light switch from Smart Home Products is compatible with Alexa and Google Home without the use of a hub. This light switch comes in black and is designed to be installed in the wall. It allows you to wirelessly control your lights from anywhere. You can also use the switch itself to manually turn your lights on or off. This light switch can also work with your tablet or cell phone so that you can control your lights with your device. You can set timers and schedules for your lights to come on when you’re not home. This helpful safety feature can deter burglars who are looking for an empty home. 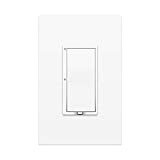 The Latest Z-Wave light switch from GE is designed to easily replace the standard 3 way switches in your home. This set comes with two lighting control switches that are designed to match most white face plates. The face plates can be purchased separately. 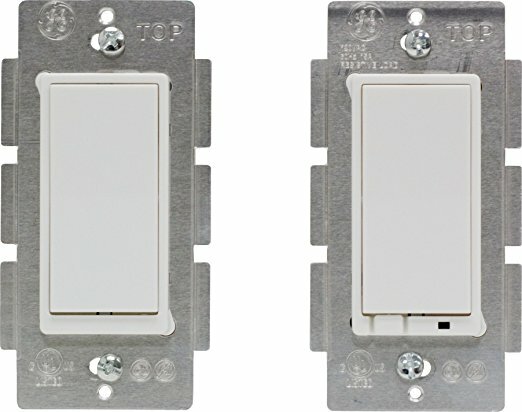 These switches require a neutral connection for installation. 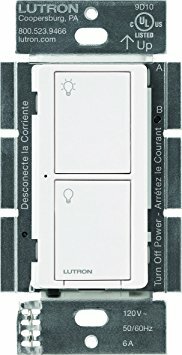 These GE switches are compatible with Alexa and can also be controlled wirelessly with your tablet, phone, or computer. The switches can be used in groups throughout your home and controlled simultaneously or individually for ambient lighting. The set includes a primary switch and an auxiliary switch. 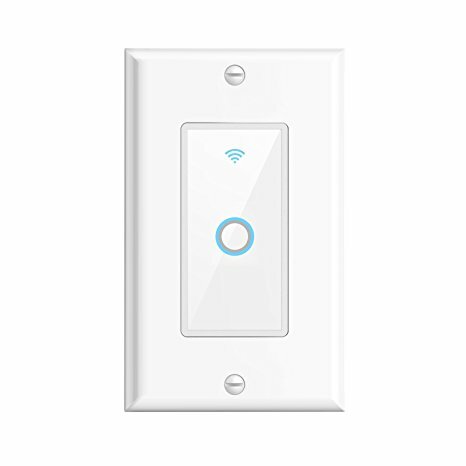 The Lutron Caseta Wireless Switch uses the Lutron Smart Bridge, which can be purchased separately, to connect with your Alexa devices. You can control your lights with voice controls. This switch can also work with the WINK hub 2 so that you can control your lights with your mobile device. The switch is compatible with Alexa, Nest, the Google Assistant, and others. 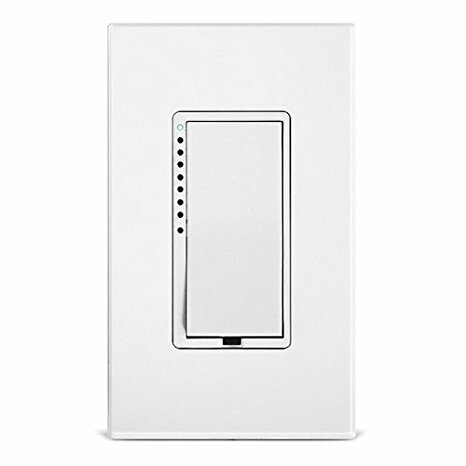 This light switch from Lutron can be installed in as little as 15 minutes using a neutral wire. This switch is designed for use in single-pole and multi-location applications. It works with up to 720 Watts of nc/HAL/elv/MLV or 6 Amps of dimmable LED/CFL. 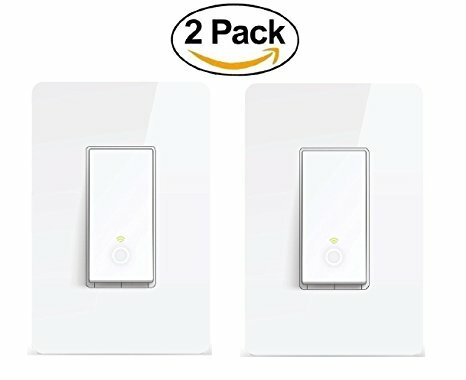 The Smart Wifi Wall Light Switch works with Amazon Alexa and Google Assistant. This switch allows you to set timers as needed and schedule your lights to come on or go off, even when you’re not at home. This switch is made of fire retardant PC and it has sensitive capacative touch control. The switch is designed for safety and durability. This light switch from VFEEL has 3 switches but can fit into a 1 gang wall box. The switch comes with a 1-year warranty from the manufacturer. The switch is easy to connect and can be set up and synced with your devices in no time. The Smart WiFi Switch from MEAMOR is compatible with Amazon Alexa and Google Assistant. This switch can also be controlled by your mobile device using the apps that are available on the App Store and Google Play. You can easily turn your lights on and off wherever you are, allowing you to give the illusion that you’re home when you’re not. This switch from MEAMOR doesn’t require the use of a hub. It comes with a lifetime warranty against manufacturer’s defects. This light switch can be beneficial for those who are conscious of wasting energy as it works efficiently and allows you to turn off the lights when you don’t need them no matter where you are. The Insteon Smart Wall Switch uses the Insteon hub, which can be purchased separately, to interact with your Alexa device. You can use voice controls to turn your lights on and off as needed. This light switch is compatible without nearly any load type. It works with incandescent, fluorescent, LED lighting and general purpose fans. This light switch from Insteon can be installed in as little as 10 minutes. The installation process requires the use of a neutral wire. Once the switch is installed you can quickly sync with your Alexa device using the Insteon hub. The Laudo Smart Light Switch can connect with your Alexa device so you can control your home lights without the need for a hub. This switch also works on your WiFi network so you can use your phone or tablet to control your lights using an app. You can set timers to turn lights on or off when you’re not home. You can also create a custom schedule for your lights. This light switch is FCC and CD approved for safety and quality. The switch comes with a 100% satisfaction guarantee and a 1 year warranty from the manufacturer. It’s made of fire retardant PC and has sensitive capacitive touch control. 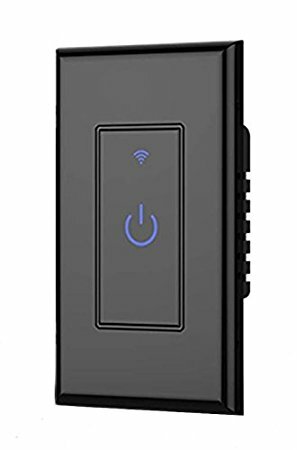 The Oittm Smart WiFi Wall Switch is able to connect with you mobile device or tablet through your home WiFi network. This light switch is also compatible with your Alexa device and can be used without a hub. It gives you the option to schedule a safety timer so that is appears you’re home when you’re not. This can be especially beneficial for those who travel frequently. This light switch has a unique smart touch control for ease of use. It also features an LED light so that you can see the panel in the dark if you wish to control it manually. This switch has a slim profile and lays flat against the panel. 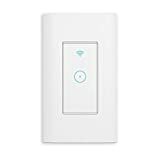 The TP-Link Smart light switch can be used with your Alexa devices without the use of a hub. This light switch is relatively easy to install and it requires the use of a neutral wire. It can also be used with Google Assistant or controlled remotely using Smart Switch and the free Kasa app which can be downloaded on your compatible phone or tablet. 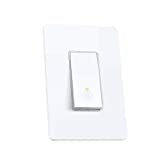 This smart light switch from TP-Link allows you to use the away-mode to control your lights when you’re not home as a safety measure to deter criminals from trying to enter your home. This switch is designed for use in a single-pole setup. Installing a smart light switch in your home can have many benefits. If you choose a light switch that is compatible with your Alexa devices, you can use voice commands to turn your lights on and off whenever you want. 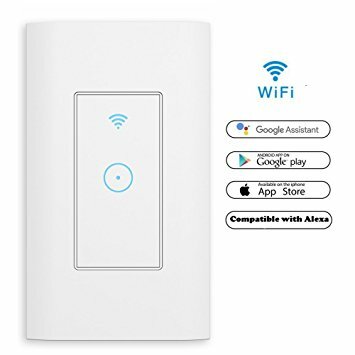 Many smart light switches can also be used with Google Assistant and your home WiFi network. Most of these types of light switches allow you to control your lights even when you’re not home so you can give the illusion that someone is there, greatly reducing your chances of your home being broken into when you’re away. When shopping for a smart light switch that works with Alexa, be sure to read up on the installation process. Most are very easy to install and can be done by those with little electrical knowledge. Other types may require a professional for installation. 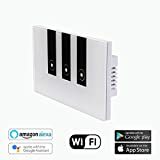 You should also be aware of the type of connection you need to work with your devices as some switches require the use of a hub to function in your home. You can read consumer reviews online to find a good Alexa light switch that will add convenience to the way you enjoy your time at home.